If the cruise control system malfunctions, it cancels automatically. The CRUISE indicator light in the vehicle information display then blinks to warn the driver. If the CRUISE indicator light blinks, turn the cruise control switch off and have the system checked by a NISSAN dealer. The CRUISE indicator light may blink when the cruise control switch is turned ON while pushing the ACCEL/RES, COAST/SET, or CANCEL switch. 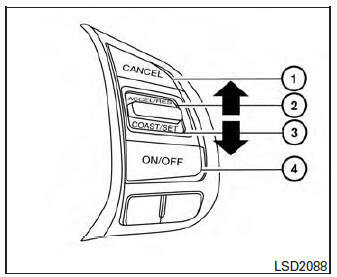 To properly set the cruise control system, use the following procedures. When it is not possible to keep the vehicle at a set speed. In heavy traffic or in traffic that varies in speed. On winding or hilly roads. On slippery roads (rain, snow, ice, etc. ).